Innovative Developments in Virtual and Physical Prototyping presents essential research in the area of Virtual and Rapid Prototyping. 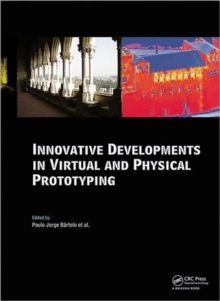 The volume contains reviewed papers presented at the 5th International Conference on Advanced Research in Virtual and Rapid Prototyping, hosted by the Centre for Rapid and Sustainable Product Development of the Polytechnic Institute of Leiria, Portugal, from September 28 to October 1, 2011. A wide range of topics is covered, such as CAD and 3D Data Acquisition Technologies, Additive and Nano Manufacturing Technologies, Rapid Tooling & Manufacturing, Biomanufacturing, Materials for Advanced Manufacturing Processes, Virtual Environments and Simulation, Applications of Virtual and Physical Prototyping Technologies. Innovative Developments in Virtual and Physical Prototyping is intended for engineers, designers and manufacturers who are active in the areas of mechanical, industrial and biomedical engineering.